Discuss shipping expectations at the beginning of a project. Plan your distribution (immediate use, mail, warehouse, drop shipment). Compare corresponding costs of these distributions. What information should be included on your carton labels? Do you need special carton quantities? 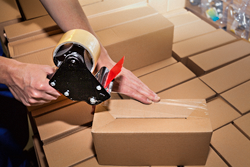 Do quantities need to be shrink wrapped? Do out-of-state shipments require special routing? Review a faxed delivery receipt to verify information.